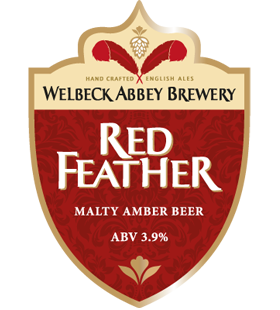 We are pleased to announce that Welbeck Abbey Brewery‘s Red Feather (3.9% Amber Ale) is the latest addition to the festival’s beer and ale line up. Red Feather takes inspiration from the emblem of Welbeck and its crossed red feathers, which represent pride in the estate’s heritage and entrepreneurial spirit. Red Feather is a distinctly English ale and blends a robust bitterness with caramel notes from its Crystal malts to create a moreish, malty amber beer. Make sure you get here early to sample a pint of this delicious, flavoursome seasonal beer. This entry was posted in News and tagged Ale, Beer, Ceilidh, Cider, Concert, Days Out, Events, Family, family ceilidh, Family Fun, Festival, Folk, Folk Music, Food, Hog Roast, Music, Music Festivals, open mic, Sheffield, South Yorkshire, Worrall, Worrall Festival 2013, Worrall Folk and Ale Festival by worrallfestival. Bookmark the permalink.